25 March 2019—MGP Ltd, a UK-based media company that promotes best practice in healthcare, is delighted to announce that Guidelines Live will be returning for its third year on 19–20 November 2019. Following the success of Guidelines Live in previous years, the 2019 conference will take place at Olympia Conference Centre, London over 2 days, and will educate and engage 1000+ GPs, nurse prescribers, and clinical practice and medicines management pharmacists working in primary care. 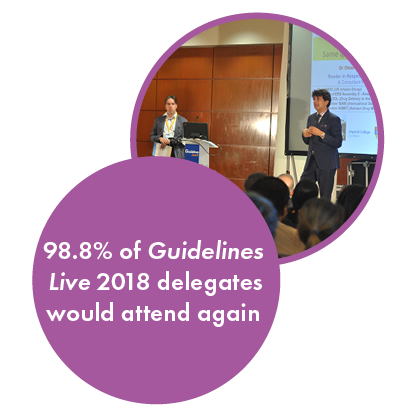 Guidelines Live 2019 will offer 12 clinical streams, including asthma, cardiovascular, COPD, dermatology, diabetes, gastroenterology, and women’s health, to keep delegates up to date with new and updated clinical guidance and best practice. For more information about exclusively sponsoring a clinical stream or exhibiting at Guidelines Live, please contact Jamie Daden at Jamie.daden@mgp.co.uk or call 07850 772714.